This year's Internet Retailer Conference & Exhibition (IRCE 2017) was teaming with energy and innovation. We were inspired to see so many of our customers and industry leaders sharing advice, best practices and insights with the 10K+ attendees. In case you missed the show, we gathered what you need to know in convenient, 140-character wisdom from the Twitter-verse. 1. Your storefront is where the consumer is. 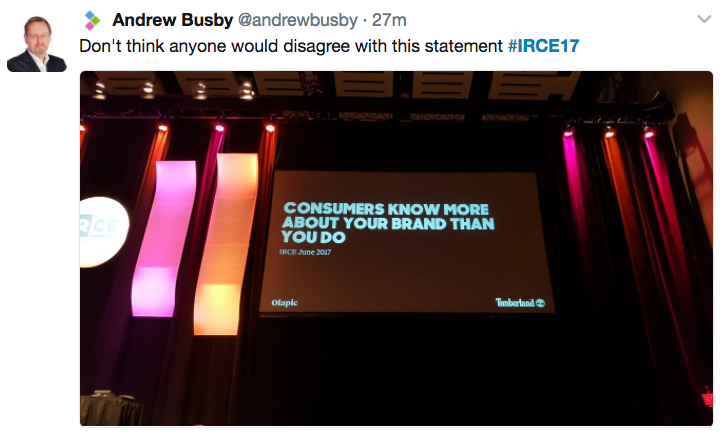 We've said it before, but it's become increasingly true: Brands and retailers have to be present whereever the consumer is shopping. We call it distributed commerce and at this year's show there was no shortage of advice on how to break down your channel walls and think of your customer as the ultimate point of sale. 2. Your customer is everywhere. 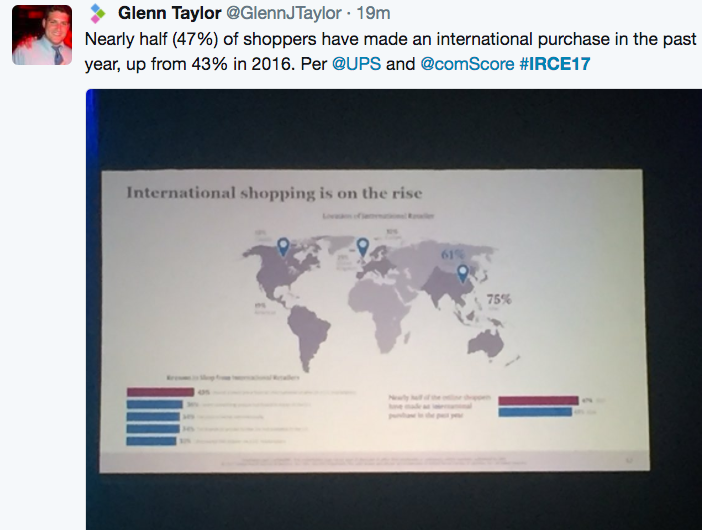 Gian Fulgoni, co-founder and chief executive officer of comScore Inc, and Louis DeJianne, corporate marketing for the retail industry at UPS, took the IRCE stage to share the results of a massive consumer survey by comScore and UPS. One of the biggest takeaways was how mobility and international shipping has changed the scale and reach of every brand online today. Shoppers expect you to remember preferences, make relevant recommendations and incorporate those needs into every message, every landing page and every in-person store interaction that is relevant to their needs. 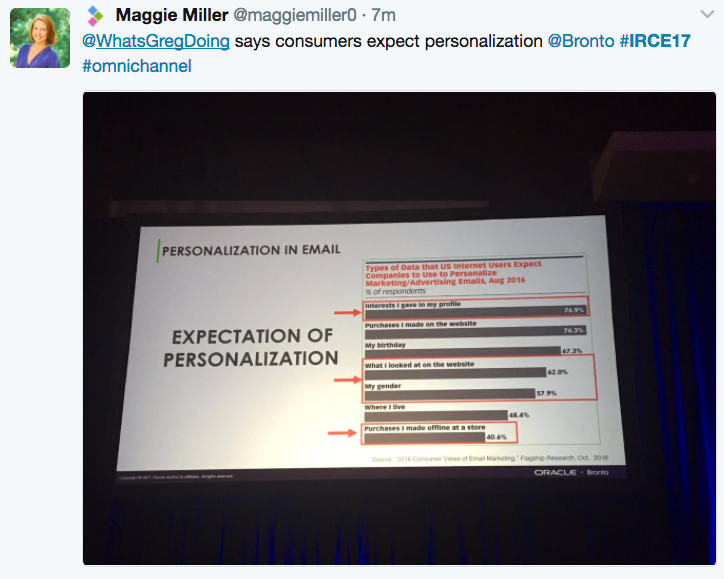 Greg Zakowicz, senior commerce marketing analyst at Bronto Software, spoke to the new demands around personalization that are impacting every brand and retailer that is selling online today. 4. Shoppers want selection. Amazon reigns. This one may speak for itself. It's no surprise that Amazon has become the primary search engine for shoppers. Brands: Optimize your presense and product page on the ecommerce giant. Retailers: Heed the importance of selection when it comes to your own storefronts. 5. Be authentic in your product detail. Frank Hwang, senior manager, digital marketing, and paid media at Timberland, shared how his brand thinks about its global brand. Being trustworthy, dependable, and authentic is key in a world where shoppers dive deep into the details. The onus is on every brand to be where shoppers are and surface the most relevant, honest details about every product. The bottom line? Consumers are driving our industry forward. They are more powerful and independent than ever before and we have to meet them where they are with the information they want. Being successful requires the agility and flexibility to be where shoppers are and be relevant to their needs.